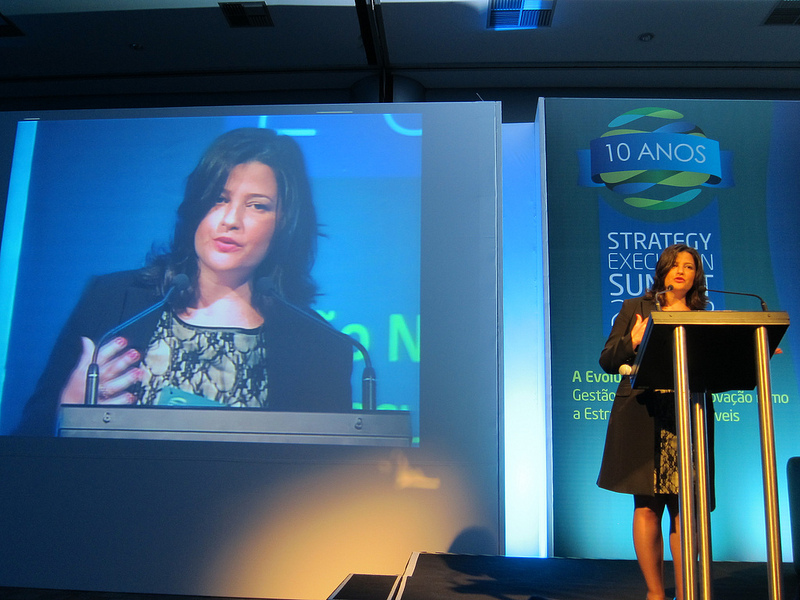 It has been a very intense couple of days for myself but much more for my wife Maria, Director of Education at Symnetics Brasil, who is responsible for organising the Strategy Execution Summit. The summit takes place annually in São Paulo and is the largest and most important of its kind in Latin America. It is always interesting being British in Brazil, as you become more sensitised to how the British and international press portray this country, and this has especially been the case with the spotlight falling not only on the preparations for the World Cup and Olympic Games, but also on both the unexpected emergence of national protests which have already had an impact on Government policy and consciousness, and a slowdown in economic growth and international investment. This is an important question “What do we do now?” and at times it can seem that no organisation has the answer. But over the last two days in São Paulo, out of the limelight and away from the attention of the world’s media, many of the most important national and international businesses in Brazil and Latin America as well as many representatives from many different Brazilian governmental ministries, departments and municipal organisations gathered to discuss strategy. The strategies of those in attendance impact heavily not just in their customers, but on every single person in Brazil, and will do for generations. It is for this reason that I would really like to highlight just how important the Strategy Execution Summit is, for it is here where really and workable long-term solutions that are confronting organisations were discussed, and I would like to offer the suggestion that more than just a talking shop, the emphasis is not just on ideas, but on how to implement and execute strategy in a manner which can sustain both the live of the organisation, but also the eco-system in which it operates. The theme this year was The Necessary Evolution, a nod to Peter Senge’s book The Necessary Revolution – How Individuals and organisations are working together to create a sustainable world, and as I hope I can show in this article which is just an overveiw of the themes from the summit, this ecosystem was not just Brazil, not just Latin America, but the planet as a whole, both ecological and economic. This year was the 10th Strategy and Execution Summit. Opening the event were Fanny Schwarz, Managing Director of Symnetics and Mathias Mangels, the founder. Symnetics is one of the largest independent boutique consultancies in Brazil, and they also have offices in Columbia, Mexico, Chile and Argentina, with their parent company Tantum Group having a global presence. They were responsible for bringing Balanced Scorecard methodology to Brazil in partnership with Robert Kaplan and David Norton, the creators of BSC. Having taken us through a brief history of the development of strategy in Brazilian organisations over the last ten years, Fanny summed it up, describing Balanced Scorecard as a “philosophy of the management of strategy” and this for me was extremely perceptive. Fanny showed how this particular way of implementing a strategy had not just been taken up by companies such as Natura, Petrobras, Gerdau Açominas, Grupo Ultra, but also Brazilian Governmental agencies such as Prefeitura de Porto Alegre, the Secretariat of Minas Gerais State Government and also institutes and programmes such as Todos Pela Education (Education for All). Looking to the future Mathias noted how the new focus was now on “leadership in transformation”, the key areas being innovation, governance and sustainability. These were hot topics covered in depth in the following presentations and breakout sessions, of which I will now look at. The rest of the first morning was filled with success stories from a diverse range of industries and sectors; Ultragaz, Volkswagen Financial Services, Hospital Sírio Libanês, Agenda 2020, CNI and Embrapa. A common theme was in how dialogue could be used to develop shared understanding in complex projects and unite diverse ranges of stakeholders, and it was interesting to hear from Ronald Krummenauer, the executive director of Agência de Desenvolvimento Pólo RS and Agenda 2020. The goal of Agenda 2020 is to help develop the state of Rio Grande do Sul to become the best state to live and work, and for this they embarked on an ambitious dialogue project bringing together 850 participants. Having previously written about CNI, the Brazilian Confederation of National Industry (see my article Brazil’s Strategic Roadmap for Industry, 2013 – 2022) it was interesting to me to hear from José Augusto Coelho Fernandes, Director of Politics and Strategy at CNI who explicitly mentioned the fact that the mental models of Brazilians are still limiting their focus, and thus restricting their effectiveness in an international arena. Mental models and how to change our way of thinking is one of the foundations I teach, and I certainly think that this should receive more focus in organisations looking to develop more effective and creative ways of working. However, I would not want to sound too critical, and one of the great positives of the summit was being in such a positive atmosphere with so many great case studies which were examined in depth, including a very profound and open look at how the Mayors Office of Porto Alegre have been preparing both for the world cup and also the legacy afterwards. The afternoon saw the start of the break-out sessions, allowing participants to drill down into specific areas of interest, and of course I made a bee-line to the session on Business Design and re-thinking business models. Having started my career back in 1992 in the Human Factors department at BT Laboratories, it was fantastic to hear people such as Harry West, CEO of design company Continuum talk about the customer experience in the design process. At BT Laboratories we had every piece of equipment you could imagine to aid our studies of customers using and interacting with telecommunications equipment and services, but it still seems that even today even some of the largest consumer organisations in the world have not grasped the concept of the customer experience. This harks back to mental models again, but not so much of the end users, but of those business executives and their inability, or dare I say arrogance, in thinking that they think they understand their customers when they do not. I have written many articles ion my blog about phenomenology, hermeneutics and lived experience, and while this may seem at times like incomprehensible philosophical meanderings, in fact are designed to really attempt to show how difficult a time we seem to have understanding the lived experience of others. This topic, and a discussion of Harry’s case study on the experience of drinking (of which he pointed out that no one has studied, i,e, how we drink) and Tetra Pak really deserve an article in their own right, as it relates so much to the dynamic way of seeing, observation, and mental models. Although Harry’s talk was focused around design, I did enjoy our discussion on the sustainability aspects of Tetra Pak’s strategy and philosophy, and it was just a shame there was not more time at the summit to include these aspects of design too. Ending the day were David Norton and Robert Kaplan who were appearing at the summit together for the first time (via video link from Boston). Their Balanced Scorecard methodology is the fifth most used management tool in the world. I have called this article The Transition of Business and if you are not involved in the implementation of business strategy and their tools, the discussion of one such tool may seem a little corporate and unrelated to social issues and sustainability. But the Balanced Scorecard is not just a tool to increase stakeholder value in a business. Its uses are far wider than that, and in fact, revolutionary, a fact still not picked up by the financial media I would say. As Robert Kaplan said, the Balanced Scorecard has shifted the focus of businesses from focussing purely on shareholder value to understanding the need to focus on the community as well. Complementing my work on mental models is the philosophical work I do to understand systems as authentic wholes. This is an aspect of the dynamic way of seeing articulated by philosopher Henri Bortoft, and again I feel I will need another article to explore the dynamic way of seeing Balanced Scorecard. David Norton explained how there has been a shift in our economic models whereby “the foundation of the world is now in intangible assets.” The task we face is to measure intangible assets, and therefore if we have a dynamic way of seeing, which is a higher level cognitive function than merely physical sensation (seeing physical objects), then perhaps we can start to make progress from mistakenly modelling counterfeit systems to being able to truly comprehend authentic systems. For David Norton, “description is the ground level of the discipline” and this very much echos Bortoft’s exemplary work on the act of distinction and how this relates to systems thinking. (As I have said, I will probably attempt to flesh out these ideas in a later article). One final parallel with the dynamic way of seeing which was exemplified by Goethe’s work on plants, and the Balanced Scorecard Methodology was really highlighted for me by Robert Kaplan’s discussion on the way in which it has made a difference in people’s lives. He discussed the case of the city of Barcelona, who following the Olympic Games used the methodology to really address many different strategic issues facing the population. Barcelona became a huge success based on visionary leadership, but as Kaplan observed, “the very act of translating the strategy into a strategic map transforms people”. People become more committed to the strategy and are better able to develop consensus, two key pillars of BSC. As our world becomes ever more networked, companies and organisations are co-creating their strategies with stakeholders, and this is also happening in Brazil, as well as other countries mentioned such as South Korea, Singapore and Chile. One of the questions put to Robert and David was “can technology help in the management of strategy?” While this is a very valid question as we move to cloud computing and more sophisticated on-line tools for collaboration, it is also perhaps an example of how our own mental models and conceptions of reality may not allow us to see that Balanced Scorecard is a philosophy as Fanny said in her opening comment, and in this philosophy we need to change our inner selves in order to really achieve the successful implementation. We have to transform ourselves if we are to transform our businesses and organisations, and for this reason we really have to learn about the totality of what this powerful methodology can achieve. The talk of David and Robert was extremely profound, and really brought out for me just how important it is to begin with visionary leadership. They discussed many different mega trends, one being the move from developing strategy in secrecy and in silos, to developing strategy in a more open and connected manner, and hence communication skills become even more critical since BSC really can help solve complex problems. Leadership must not only be visionary, but “moral and ethical” and it is this theme that was really picked up in Day two (which I will cover in a separate article). Obviously a major aspect of any summit is the opportunity for networking and conversation, and in the evening Maria had invited Omar Fantoni from Minas Gerais to cook for us a sensational paella. Omar is not just any chef, since prior to becoming a chef he had spent 31 years working for Gerdau/ Açominas, where he was Director of Planning and Control. Maria worked with Omar as a consultant for the group helping them implement Balanced scorecard, and in between the cooking Omar providing us with an interesting presentation on his strategic work. One great slide showed the development of their logo, which had been created in 2003 but which had evolved to show how the process that had been going through was now bearing fruit. This has been quite a long article and I have only briefly touched on the depth of conversation and breath of topics covered. In one of the more surreal moments, I enjoyed some very excellent conversation with journalist Edson Valente from Valor Econômico, discussing British and Brazilian music from the 1980s including the rather obscure Scottish band Arab Strap. Edson was there to cover the event and below I provide links to the various articles in Valor (Portuguese) published over the two days as they provide even more quotes and in depth analysis. Congratulation on your text, it is a very good summary of the event.